A lot of the customers I help at the store I work at on the weekends are new to the Mac platform. There are three main reasons they switch: They are tired of the problems they're having with Windows PCs, they have an iPhone or another Apple device that they're happy with, and they have friends, family or other trusted people who tell them about their own experience. They also have a lot of questions. Here are some of the basics I cover with them. Every week our Peter Cohen brings you Switch to Mac — a column to help you move from Windows PC to the Mac and OS X! It's worth understanding that about half the people who walk into an Apple retail store to buy a Macintosh are new to the platform. So you're not unique. Apple's invested a lot of time and effort to make the transition as painless as possible. Don't Macs cost a lot of money? Not really. You certainly can spend a lot of money on the Mac, but a basic Mac mini will only set you back $499. And that Mac model is more than enough for a lot of people. 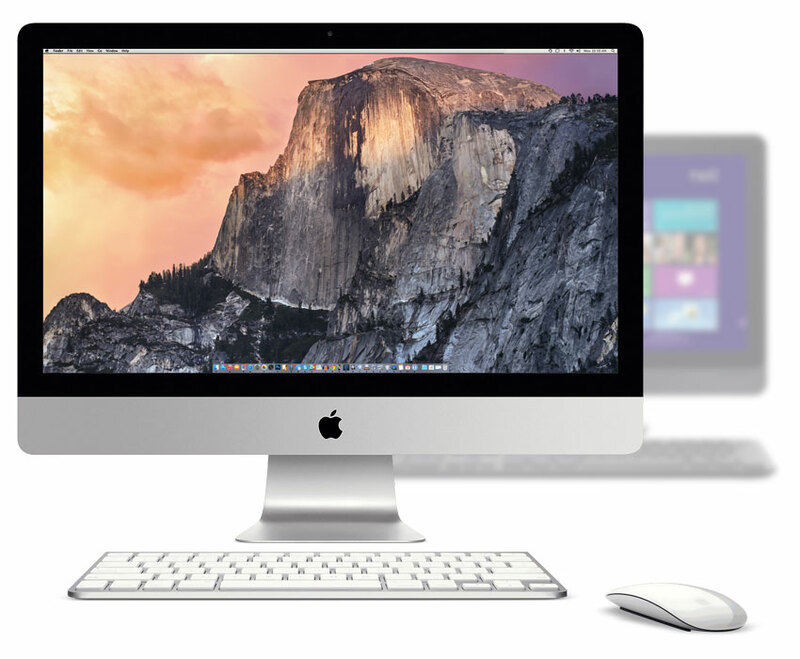 The Mac mini will let you re-use your existing PC monitor, keyboard and mouse, too. Sure, you can pick up a cheaper PC, but I'd challenge you to find one in that price range that comes nearly as well-equipped as the Mac mini does — it includes the exact same suite of software included on every other Mac. What's more, the Mac mini doesn't include a lot of trial software or adware that's going to get in your way. Isn't using the Mac more difficult than a PC? There are a few things you're going to need to relearn, of course: The command key is like the control key on a PC. The option key works like the alt key. And the absence of a lot of mouse or trackpad buttons sometimes confuses PC users (more on that later). But Apple knows that, so they've included help to guide your transition right into the operating system. If you click on the Help menu in the Finder, you'll see Get to know your Mac. Select it and you'll be brought to an Apple web page where you can learn more about how the Mac works. Clicking on the Help menu again, click on Mac Help then select New to the Mac? and see even more info that will be helpful to you. It's all there, built right in. Do I have to use a special mouse/keyboard/hard drive/printer? No. Apple's really good about making sure that commodity peripherals designed to work with PCs will work with the Mac too. External mice will be recognized as soon as they're plugged in, and contrary to the belief of some, the Mac does just fine recognizing more than one mouse button (it should recognize the right button as a "secondary click" right away, and many mouse makers these days also offer Mac drivers if you want to customize how it works). PC Keyboards are also work fine — the Mac recognizes them and asks you to type a couple of keys to make sure it knows where everything is. External hard disk drives should be reformatted for the Mac using the Disk Utility found in the Utilities folder. And if the Mac doesn't have driver software for your printer already included with it, it can usually download the software from Apple's servers without any hassle. But does Office work on the Mac? Yep, Microsoft has made Mac versions of Office for many years. You can buy it outright, or if you prefer, subscribing to Microsoft's Office 365 program (for about $10 per month) will let you install it too. And Office is even available for iOS. For casual users, there's less need for Microsoft Office now than there used to be, because Apple includes a very competent set of productivity apps that mimic some of the capabilities of Office — Pages is Apple's word processor; Numbers is Apple's spreadsheet app; and Keynote is Apple's presentation software (analogous to Word, Excel and PowerPoint, respectively). And all those apps can import and export their Office document counterparts. Up until 2013, Apple charged extra for those apps, but they're included with new Macs now. Having said that, some people prefer to use Office because it's what they're used to. And that's fine. The choice is yours. Macs aren't as nearly susceptible as most PCs are to getting malware infections like viruses, trojan horses, keyloggers and other nefarious software. Most of that software is aimed squarely at security exploits that exist in Windows. Apple has its own countermeasures for dealing with this sort of problem: anti-malware software called Gatekeeper, built into the Security & Privacy settings in the Mac's system preferences. Ordinarily, software can only be installed on your Mac if it's been downloaded from the Mac App Store, and Apple checks all that software to make sure it doesn't have these sort of problems. You can override those preferences if you want, and that's how people with Macs typically get problems with "adware" — software that hijacks the web browser and redirects searches. So my recommendation is to not override the system preferences unless you really have to, and then, be very careful about where you download software from. Some third-party companies make anti-malware software for the Mac. Ordinarily you don't need to run it, but it's there if you want to be extra careful. I have an app that only runs on Windows. What do I do? Although there are some apps that only run on Windows, there usually is an equivalent that runs on the Mac, so I'd shop around a bit to see if you can find an app (or ask here or in iMore's Mac Apps & Games forum). The Mac runs OS X — a different operating system from Windows, so the same apps that run on your PC won't run on your Mac under ordinary conditions. But the Mac is quite flexible, and can be configured with software that will let your Windows apps run. In fact, Apple makes software called Boot Camp that will let you partition part of your Mac's hard drive for Windows, and use it accordingly. When your Mac is running Windows, it is a Windows PC, for all intents and purposes. One downside to Boot Camp is that it requires you to restart your Mac each time you want to use Windows or OS X. To get around that, you can install virtual machine apps that will let you run Windows apps at the same time as you're running OS X. There's a free one called VirtualBox; there are commercial products including Parallels Desktop and VMWare Fusion. You can download the commercial ones and try them out before you buy them. Bear in mind that you will need a copy of Windows (and whatever Windows-specific apps you'll need) to install on your Mac, too. Can I bring my data files over from my PC? I know I'm only scratching the surface here, so if you have other questions about switching to the Mac from Windows, let me know.